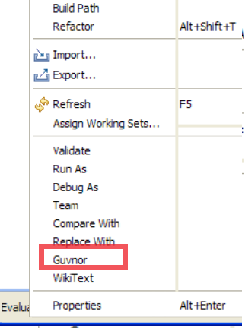 And in guvnor itself I can not see the sample folder under the default package. Do I have to configure something that is not mentioned in the installation documentation? I had the same problem then I discovered that you need to create a guvnor connection from the guvnor window. Then the guvnor menu item appears on any bpm file. So the popup menu entry is only available if a repository connection exists OR a second option which I dont understand. Must have changed since the video was recorded. Yes, you do need to fist create the connection with your guvnor instance in the guvnor perspective before adding assets to it. Thanks guys. I got it. Window->Open Perspective -> Guvnor Repository exploring.